Ernest John Luffman, known as 'Dyke', was born in Yeovil in 1892, the son of gardener's labourer John Luffman (b 1867) and Alice née Gillingham (b 1866). In the 1901 census the Luffman family were living at 98 & 100 Sherborne Road; the family comprising 8-year old Ernest's 67-year old grandfather George Luffman, a cowman on a farm, his 14-year old uncle Sidney and then his parents John and Alice together with his siblings Mabel aged 12 and William aged 8. In the 1911 census John, Alice and the three children were listed at 98 Sherborne Road and at this time 18-year old Ernest was listed as a printer's machinist and was working in the printing department of the Western Gazette on the corner of Middle Street and Newton Road. 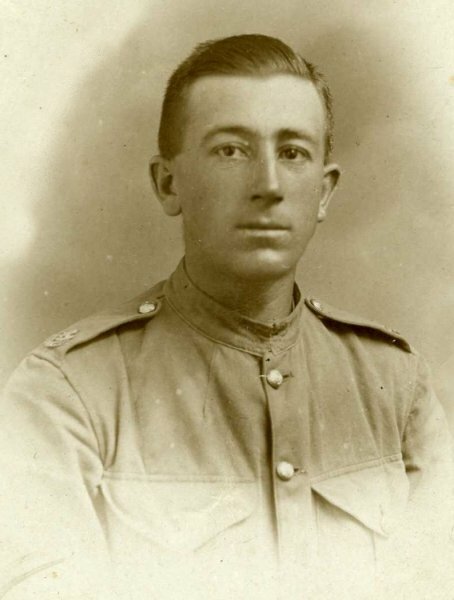 As soon as war broke out in 1914 Ernest enlisted in the Army and became Private (Service No 240834) in 1st/5th Battalion, Somerset Light Infantry. He was to serve throughout the war with the Battalion. He enlisted with John Pound, who had the next Service Number, 240833, and both men served side-by-side throughout the war. Both men died within a few weeks of each other, and both from pneumonia. The Regimental History of the Somerset Light Infantry records the detail of the Action of El Mughar and the part played in it by the 1st/5th Somersets, including Private Ernest Luffman - "On the 12th the Battalion moved forward and occupied a ridge south of El Kustineh and El Turmus, digging in and remaining in the position during the night of 12th/13th. The task allotted to the 233rd Infantry Brigade in the attack to take place on the 13th November was the capture of Tel El Turmus - El Kustineh (both inclusive) with El Mesmiyeh as a further objective. It was now evident that a position of great natural strength could not be taken by an unsupported attack. Consequently the troops engaged were ordered to stand fast and the Somersets were withdrawn after nightfall, covered by the 2nd/3rd Gurkhas. The 1st/5th Battalion of the Somersets had gone into action on 22 November about 450 strong but had suffered 221 casualties in the two days' fighting - 3 officers killed and 6 wounded with 51 other ranks killed or missing and 161 wounded. Apart from a brief involvement in the Battle of Sharon, fought between 19 and 25 September 1918 in the final months of the Sinai and Palestine Campaign, this was the last fighting the 1st/5th Battalion saw in the Great War. Sadly, however, in November 1918 Ernest Luffman was hospitalised in Alexandria, Egypt, with bronchial pneumonia. He died in hospital on 4 December, aged 26. His friend, another Yeovil man from the same Battalion, John Pound, with whom he served throughout the war, also died of pneumonia on 22 December. On 13 December 1918 the Western Gazette reported "Much sympathy is felt with Mr and Mrs John Luffman of 100 Sherborne Road, who received the sad news on Monday, by a telegram from the Record Office, Exeter, stating that their son 240834 Private EJ Luffman died at one of the Alexandria Hospitals, Egypt, on December 4th from bronchial pneumonia. The deceased, who was before enlistment employed in the general Printing Department of the “Western Gazette” joined up on the outbreak of war in 1914, went to India in October of the same year, and was later transferred to Palestine. Another son is serving in Mesopotamia. Mr and Mrs Luffman and brother and sister desire to express their heartiest thanks for the kind sympathy which has been shown to them in their sad bereavement." 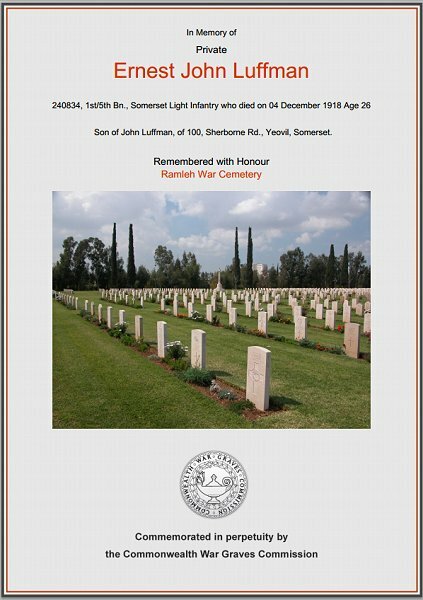 Ernest John Luffman was interred in Ramleh War Cemetery (Grave A.73). His name is also recorded on the War Memorial in the Borough. The Commonwealth War Graves Commission certificate in memory of Ernest Luffman.